For the first time, a woman captain led Britain’s Changing of the Guard ceremony at Buckingham Palace. Canadian officer Megan Couto made history on June 26 by commanding the troops guarding Queen Elizabeth’s London home. Couto, 24, led her Canadian unit in the ceremony, which is witnessed by thousands of visitors to London each year. Her unit is the Second Battalion, Princess Patricia's Canadian Light Infantry, also known as "The Patricia's." "I'm just focusing on doing my job as best I can and staying humble," said Couto about the historic event. She told Reuters news agency just before leading the troops she was feeling “a little bit of healthy stress.” She added: "This is definitely a big deal for us." The Queen’s Guard ceremony usually is led by a soldier from the mostly male British Army’s Household Division. The British Army said Couto was the first ever female infantry officer to lead the ceremony. “We look forward to seeing a British Army female infantry captain of the queen's guard when roles are opened up to women by the end of next year,” a statement read. Women were barred from serving in the British infantry and other combat roles until the military changed the rule last year. Canadian Captain Megan Couto, second right, makes history by becoming the first female Captain of the Queen's Guard as she takes part in the Changing the Guard ceremony at Buckingham Palace in London, Monday, June 26, 2017. 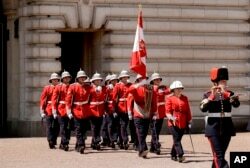 The Canadian unit was invited to Britain to mark Canada’s upcoming 150th anniversary. Canada Day is celebrated on July 1. Canada was established on July 1, 1867, when Britain’s parliament approved the British North America Act. The act established the Canadian Confederation out of three British colonies. Canada, along with several other nations, still belongs to the British Commonwealth. Queen Elizabeth still serves as the country’s official head of state. Many celebrations will be held throughout Canada to mark the country’s 150th birthday. Among the activities will be parades, music and cultural performances and fireworks. Britain’s Prince Charles and his wife Camilla are to spend three days visiting Canada to mark the anniversary. In Britain, people plan to gather in London’s Trafalgar Square to take part in a celebration for Canada Day. The event will feature musical performances, Canadian food, sports and other activities. Bryan Lynn wrote this story for VOA Learning English, based on reports from Reuters and the Associated Press. Caty Weaver was the editor.